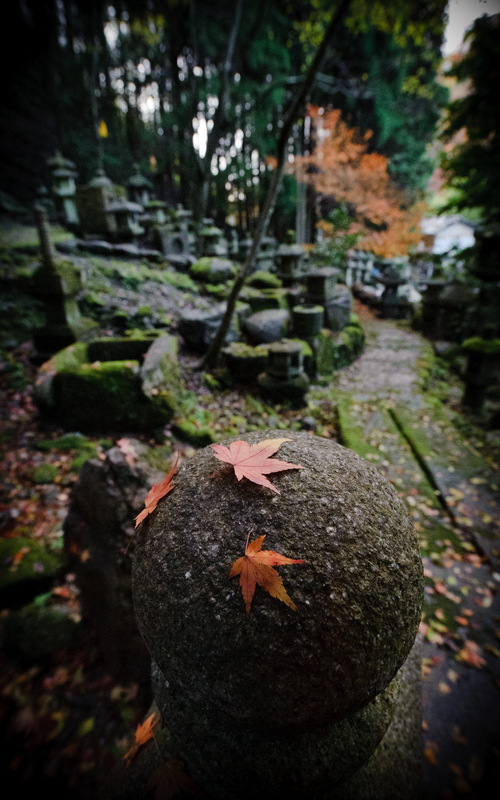 As I mentioned yesterday, the visit to the workshop and gardens of Nishimura Stone Lanterns (a fifth-generation hand stone-carving business) and their back garden was an amazing, overwhelming, mentally draining experience. I haven't even given my photos a first-pass inspection, but soon after taking the photo above I knew it was emblematic of our time there, and knew that I would post it early. 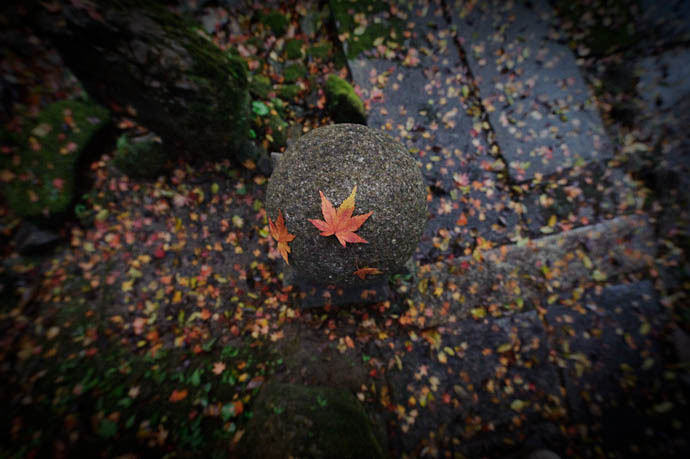 As you can see in Paul's shot, the leaves are resting on a fairly simple square column, with a few adornments at the top, ending with a nice round ball. It looks like various pieces are stacked, but it's a single, solid piece of stone. It's one of the most simple items there. 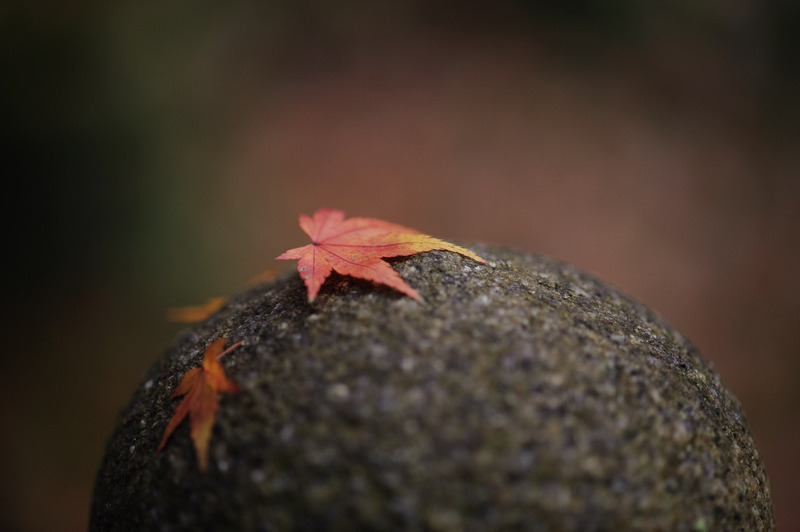 Leaves were lying everywhere, but I felt drawn to how these three particular leaves found themselves on top of the column, so I endeavored to capture the scene, and the sense of calmness I felt they exuded. The problem was that so very many opportunities immediately presented themselves that I felt overwhelmed. Unworthy. Inadequate. What About Looking Straight Down? I'm disappointed in that last shot because, well, it's boring, but I put a lot of work into getting it, so I'll share it here. I'm not sure what I was hoping for, but I thought it might be a bit more dramatic, but as it was, the height of the pillar is completely lost and so the leaves lack context despite the fact that you can see all around them. Boring. The problem I had in getting this shot in the first place was in keeping my feet out of frame. I'm tall and so have long arms for holding the camera away while pointing down, but apparently not long enough for when a 14mm lens is used with a full-frame camera. I couldn't stand far enough back to keep my legs out of frame. So, I had Paul stand up-slope from me and adopt a sturdy stance as I took his hand in one of my own, then with his support I was able to lean waaaaaaay out and over the leaves with the camera in the other, then got the shot. If anyone saw us, I'm sure they thought we were nuts. Anyway, I could have easily spent a good hour there with the camera just in exploring those three leaves. In the background of some of these shots you can certainly see that there are plenty of other stone columns, lanterns, basins, etc., and in wide sweeping views they're just that, “a bunch of stone things”. But as you walk around, you can see that each one is unique, captivating, and worthy of its own hour.... or two. It was truly overwhelming. It was exhausting as my mind raced among awe and wonderment at what must have gone into making each one, musings about how old each might be (the oldest item, we were told, predated the family, dated back 800 years), speculation as to what some of the less familiar shapes might be for, and always, consciously and unconsciously, running through photographic calculations.... compositions, depth of field, lighting, color. It was “awesome” in both the younger generation's “really amazing” sense, and in the original “struck one with a deep feeling of awe” sense. If I were a good photographer, I could produce a photo-filled post about this site every day for a year, and have it be interesting every time. I suspect that a very good photographer could do that using photos from just one season, but with the changing seasons (and even changing light during the course of a day) I'm sure many new opportunities are continually presenting themselves. I have never visited a place with such unbound potential. It's a 15-minute drive from my place, so to tap that potential, I need only to become a good photographer. I really like #4 “Maybe Standing Alone?” – the contrast between the lantern and the bokeh background, is great, and having the lantern so far off-center draws your eye to the impressionist-like background. #6 “Let’s Try For Something More Edgy” is similar, but the lantern isn’t as sharp and I don’t feel the contrast is the same, but I love the colors. Beautiful place; you are lucky to have such a great resource so nearby. 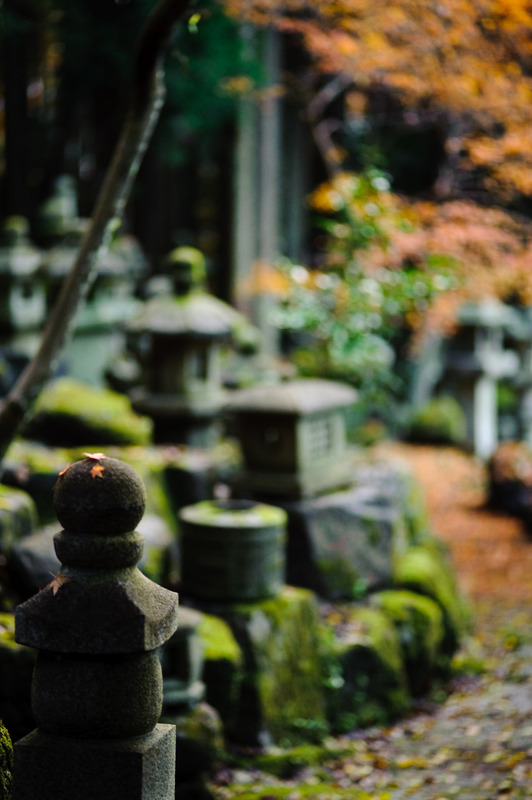 There is something about the Japanese stone lantern that is so iconic. -The stone (is it granite?) 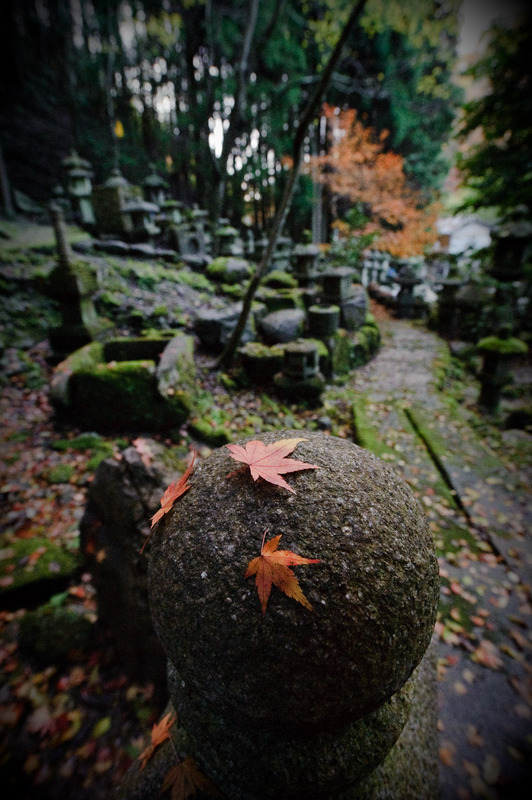 the moss and humidity of Japan that will allow it to grow on stone. The shapes. The rich and old culture that you can see manifested in the designs. Incidentally the first time I ever visited your blog was after doing a google search for the term ‘stone lantern’ . Encouragement for JF: Your talent is in your struggle! That desire you have to capture and manifest that mix of emotions and sensory experiences is what its all about. That feeling of inadequacy (when well tempered) is what’s making you photos very compelling. Hangers On is a great photo BTW [Great Double contrast between warm colors of the leaf and cool colors of the background AND crisp leaf detail and sublime bokeh]. (I’m using it as a background if you don’t mind.). If we wanted to see photos from ‘artists’ who’re ‘talented’ we could just look at all the HDR sports cars and mountainscapes on FLickr ;o). Keep shooting. Love your shots and thoroughly enjoying your struggle. (did you not have a lense of narrower dimensions in your camera bag? I did (as evidenced by the other photos), but I wanted to see what I’d get with the wide angle…. at least, what I’d get besides my feet. Nuts? Oh I dunno. Two Americans in a stone garden (notice I did not say orchard, as the term stone orchard applies to a graveyard) photographing beautiful sculptures. Although the very image that holding hands produced, comes off as too busy with two many conflicting images coming to the fore. 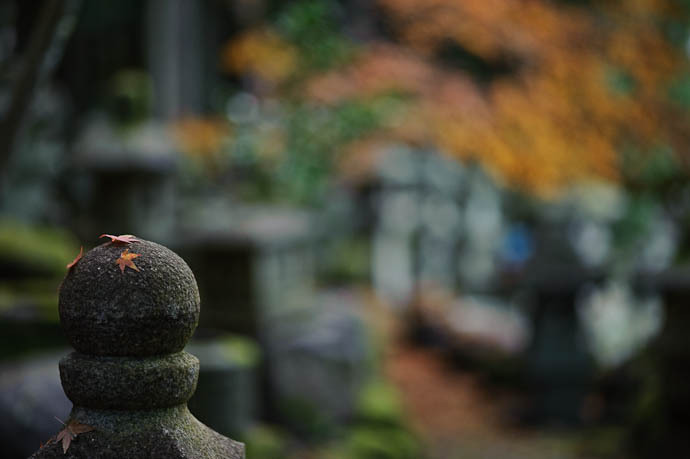 The entire series of images to me is interesting because of the green moss that adorns some stone, while others, there is nothing. 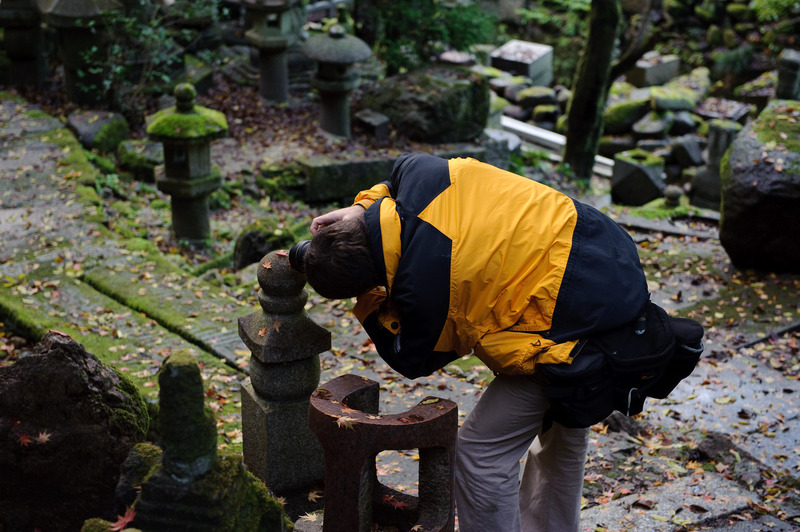 A “moist” climate probably has a lot to do with the moss as well as the geographic location. Where the sun never shines comes to mind; the moss shall grow if there’s the correct climatic conditions. Did you and Paul have formal permission to be in the back forty so to speak, or did you simply wander in unannounced? Am thinking of extreme politeness which is in some small way a hallmark of the old Japanese ways of life. Here in Southern Ontario (where it’s 1 degree Celsius this Sunday evening December 6, 2009) the extremes between the cold of the winter andthe warmth of the summer makes for interesting situations for the growth of moss either on the soil or on structures. The past two summers here (about a kilometre from the northwest shore of Lake Ontario) have been quite damp, resulting in moss growing in unlikely places, especially in my large flower garden. It has revealed to me some low spots; they need soil and too they might be a photo subject some day although there no stone objects for moss to grow, just soil after the plants have died off for the year. 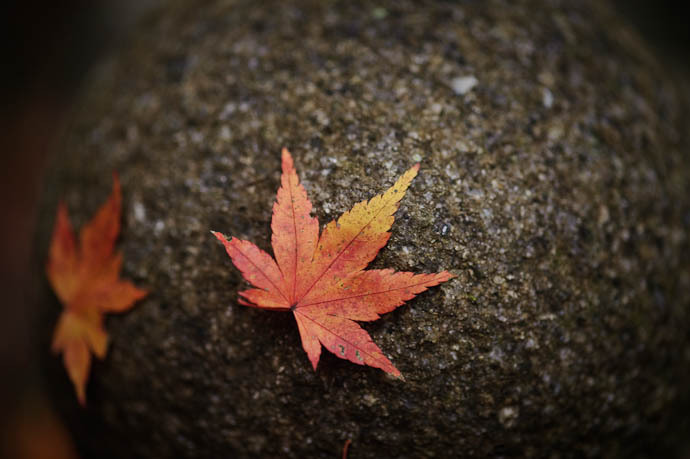 Three Leaves. “Bold” came to mind. (My) Eyes were drawn do the leaves on the globe, led by the the pathway into the background, somewhere. *sigh* Then I looked around the corners & got a mild headache. Seemingly that was due to plain old stretched corners (of a wide angle lens), instead of lens zooming during exposure as i first thought. In Let’s Try For Something More Edgy, were you trying to focus on the right side edges of the column (relativele more) in focus? Stopping down about a stop would have worked perhaps? Arigato Jeffrey for this blog, it’s helping me find the workshop. I live on Big Island (HI) and have come to Kyoto to visit an old friend and find the Nishimura Ishitoro-ten. I doubt I can afford two entrance lanterns (and the shipping!) for my farm on the Hamakua but, visiting the workshop and taking photos will be inspirational. A sansei friend in Volcano (30 miles south of Hilo) will make a knock-off in concrete… hardly the dream of moss-covered granite beauty we see in your photos but, a poor wretch’s compromise. You came in the colors of autumn; I’m here in just past primetime of cherry blossoms. I might see the ‘pink snow’ of falling blossoms on the lanterns today.